As 2016 comes to a close, we are taking a look back at all the wonderful 3-Days of 2016. We celebrated our 150th 3-Day Walk in Michigan this year, and all of the 3-Days had many high points. 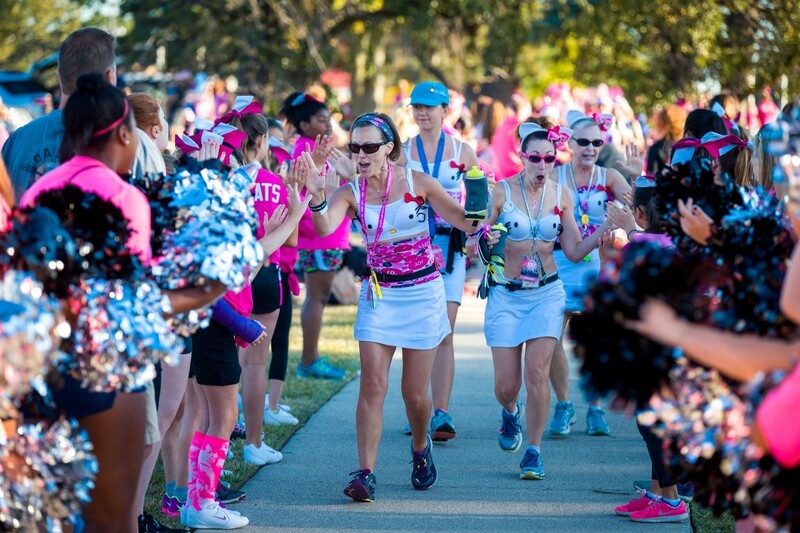 The Susan G. Komen 3-Day Coaches spent the entire year supporting walkers, crew members and volunteers across the country, and when the event season began in August, they hit the road alongside our walkers. With that in mind, we asked the 3-Day coaches to share their favorite memories from the 2016 3-Day season. Gayla (Dallas/Fort Worth Local Events Coach) – At the 2016 #MI3Day I was the caboose. 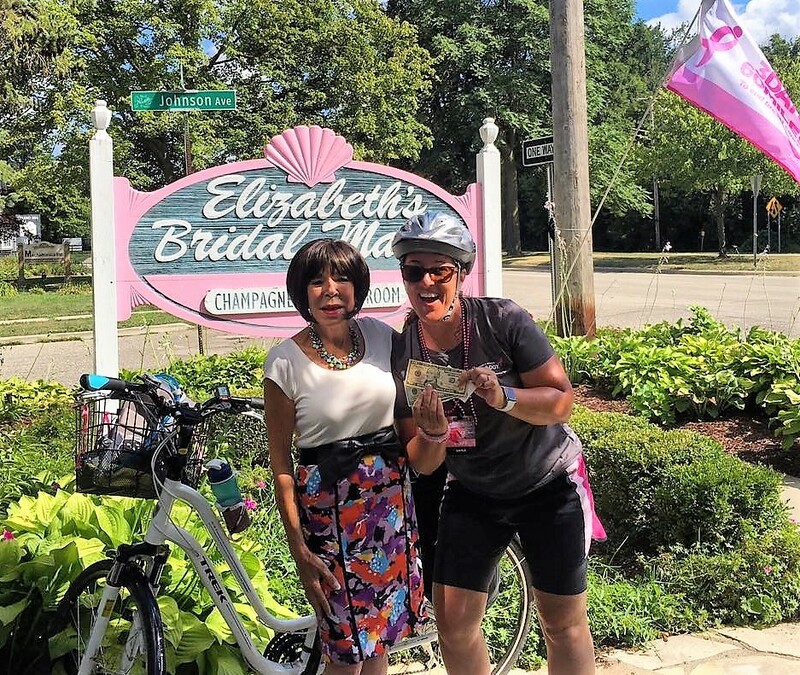 When I passed by Elizabeth’s Bridal Manor behind the last walkers, Elizabeth was outside and asked me all about the 3-Day. 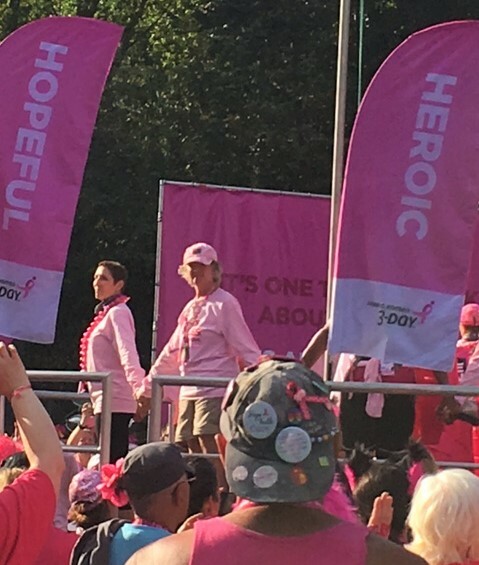 She said she had been outside cheering on the walkers as they passed and told me she’s a breast cancer survivor herself. After chatting a while she asked me to wait a minute while she walked inside. She came back outside with a $40 cash donation. Hanging out with the Survivors and Honor flag bearers at DFW 3-Day rehearsal. 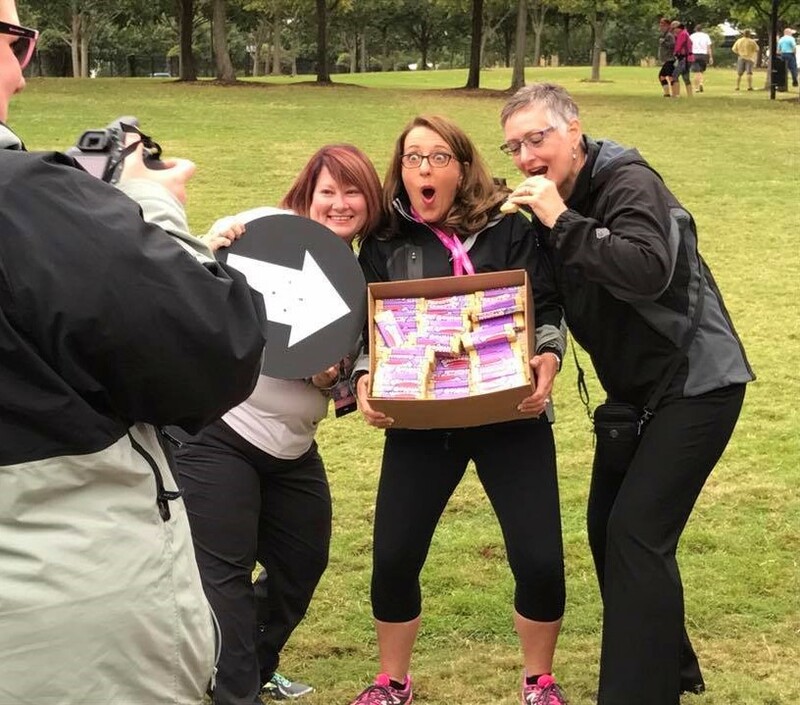 Stealing a box of grahamwiches with the DFW3Day coaches and getting caught on camera by the 3-Day Social Media Manager, Alyssa! Toasting in DFW to 150 events and the beautiful rainbow after the Closing Ceremony in DFW. Kathleen (Seattle Crew & Volunteer Coordinator) – The Seattle Bike Police were out in full force in Seattle this year. I was also the staff person on pit stop 2 in Dallas, where they built an incredible Wizard of Oz themed world! Jen (Seattle Participant Coach) – Another memory is of Kathy B. (left hand side of photo). Kathy was our Local Impact Award winner and also spoke at camp on Friday night. 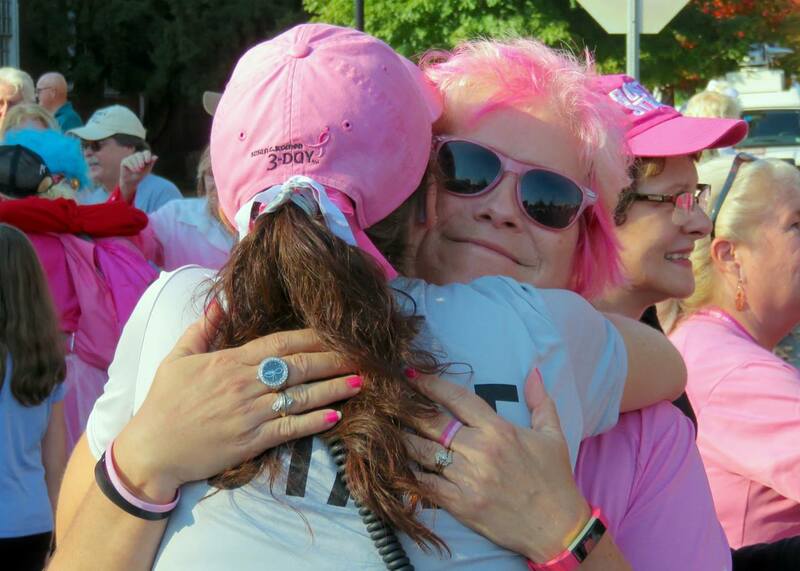 She is battling triple negative breast cancer. I got to know her in the couple of weeks leading up to the event and can honestly say I will be forever touched by her story and strength. Amazing, amazing lady. Ann (Michigan Field Marketing Coordinator) – My favorite moments in 2016 were all the times I walked into a pit stop or camp and a walker shouted my name. 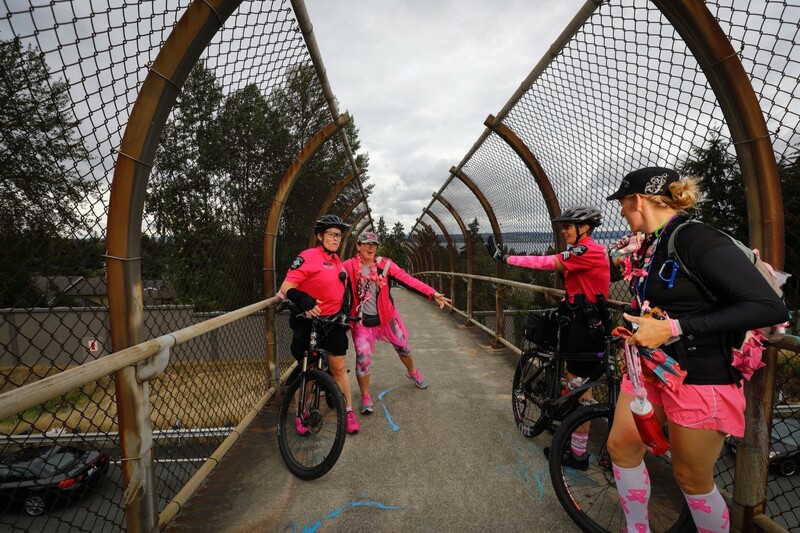 It’s always so great to connect with folks that I don’t get to see all the time and I love seeing them out on the route. It’s always so wonderful to hear about how their walk is going! Jennifer (Michigan Participant Coach) – One favorite memory happened in Michigan and that was sharing the experience with my husband, Charles. 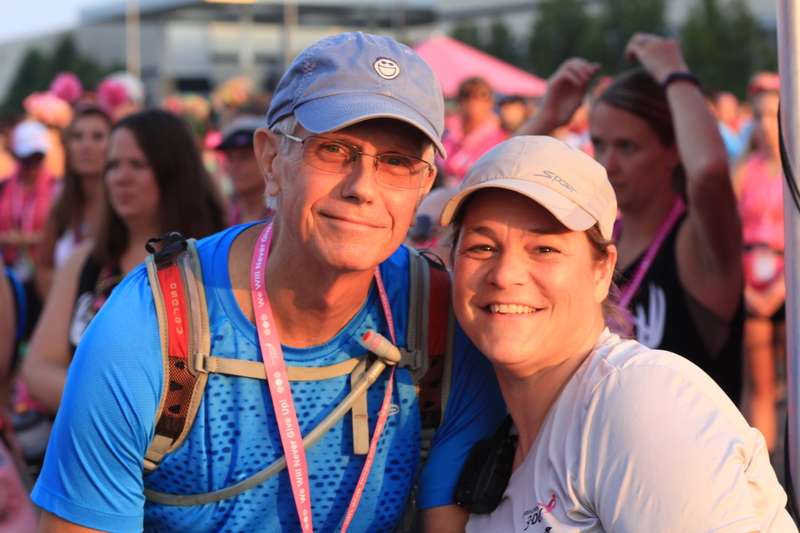 He is not new to the 3-Day but he was new to the Michigan 3-Day and it was fun to hear about his experiences on the route and at the event, which differ greatly from my own. Jennifer also said, I loved getting all of the 2016 Series walkers and crew (those participating in all 7 events) in one place for a group photo. I am the coach who works closely with this group throughout the year, mainly so they simply have one point of contact. This group is hard to wrangle into one spot so I choose Friday morning, before the Opening Ceremony, in San Diego and we were lucky enough to get this group on the stage before the ceremony began. 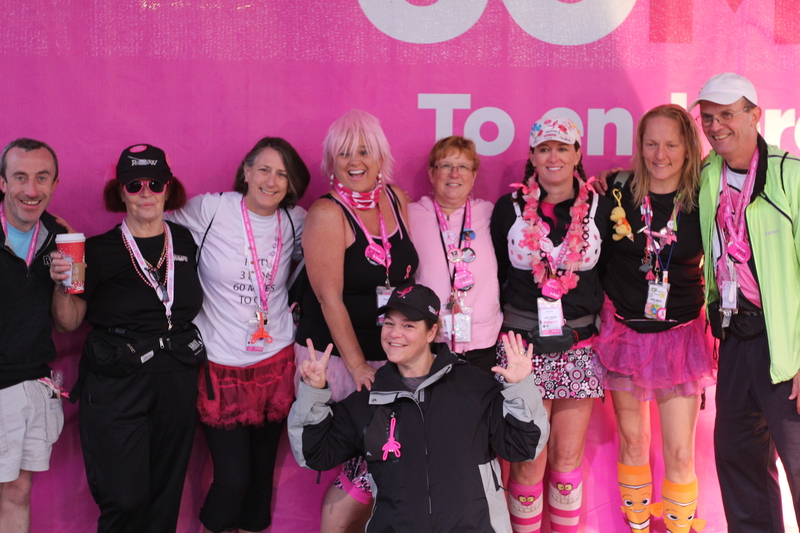 These walkers who walked all 7 events this year (from the right in the photo, Jim, Carol, Dena, Pala, Karen, Ellen & Christa) and Kenny (far left of the photo) crewed all 7 events this year. Eileen (Twin Cities Participant Coach) – One of my favorite memories was playing shuttle bus driver at lunch in the Twin Cities this year. Lunch was set up in the parking lot of a local school. It was cold and had been pouring rain all day. We decided to open the school as a place for our walkers to get out of the rain while they ate lunch. The walkers had to walk past the entrance of the school to the other end of the property to pick up their lunches. So to get into the school the walkers would have to walk the route backwards about ½ a mile (and then re-walk it when they were done with lunch!). Stephanie and I decided to run shuttles from the lunch pit stop back to the school entrance. We had so much fun doing it! It was a great afternoon and everyone appreciated our efforts. The best part for me was that I got to meet a lot of walkers I would not normally meet. Our long-time participants don’t often need a coach’s assistance so I don’t have many opportunities to get to know them. This turned out to be a great way to finally put faces to the names I see every day! Several of our staff had memories about a very special participant, Barry Blauer, who celebrated a great milestone in Michigan this year. These are their memories with Barry! Jennifer (Michigan Participant Coach) – I had a few favorite moments on the events this year but the number one for me happened in Michigan. 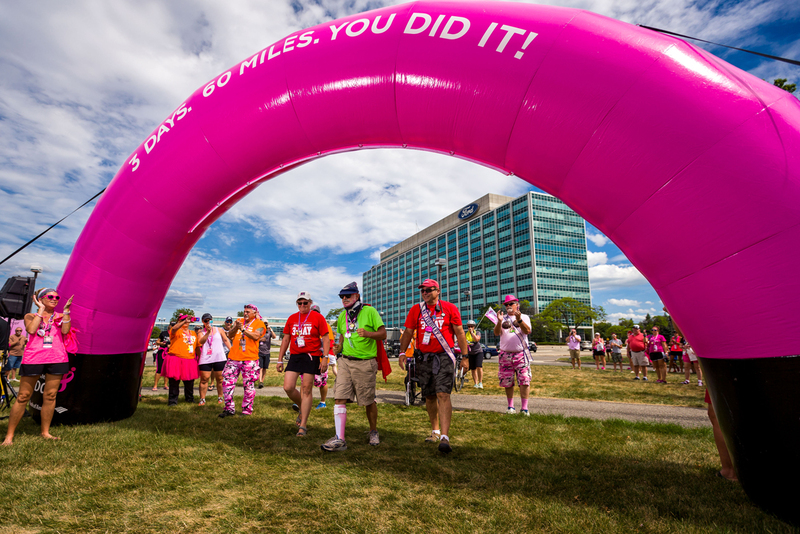 Barry Blauer is a long time 3-Day participant, and he celebrated a huge milestone while on the Michigan 3-Day this year, participating in more than 80 events. Barry was one of the original series walkers back in the day, fundraising and walking in ALL 14 events in a single year and doing it more than once. In the last few years Barry has been battling ALS. 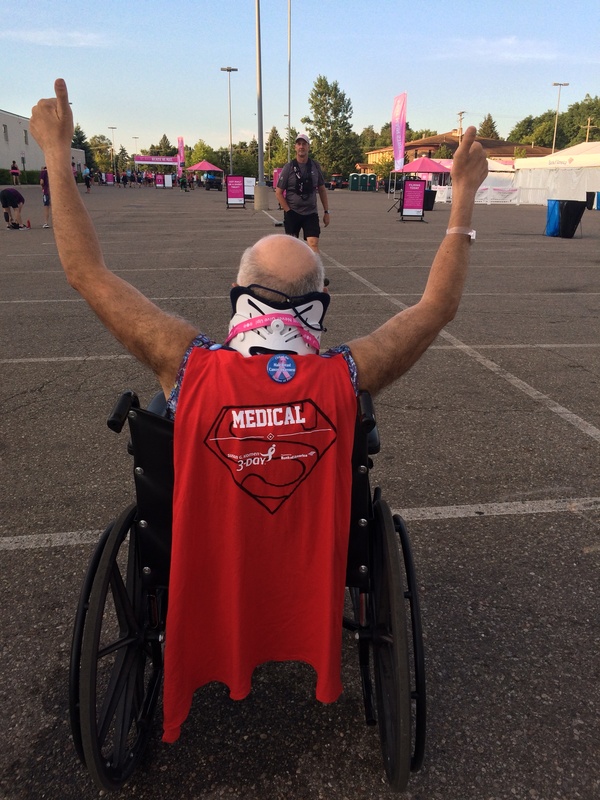 Even with his physical challenges Barry participated this year in the Michigan 3-Day. He participated in a wheelchair mostly and had help along the way. With a little behind the scenes magic, Barry was the last walker into the Participant Finish Area on the Sunday of the event and it was emotional to witness but so powerful. I was crying but I also had chills to watch his determination to WALK under that inflatable banner and all the way to the victory shirt tent. After the Closing Ceremony, I helped Barry and his wife get back to their car and the last thing he said to me as I hugged him and congratulated him again was, “I will be back next year.” Barry is currently signed up as a crew member for the 2017 Michigan 3-Day. Gina (Michigan Crew & Volunteer Coordinator) – The memory I have is Lloyd, one of our Route Safety Crew members, pushing Barry into the Participant Finish area. Everyone was on the feet, cheering, crying…paying tribute to Barry. Gayla (Dallas/Fort Worth Local Events Coach) – Walking in behind long-time walker Barry Blauer in Michigan. He’s now walked 86 3-Day events! 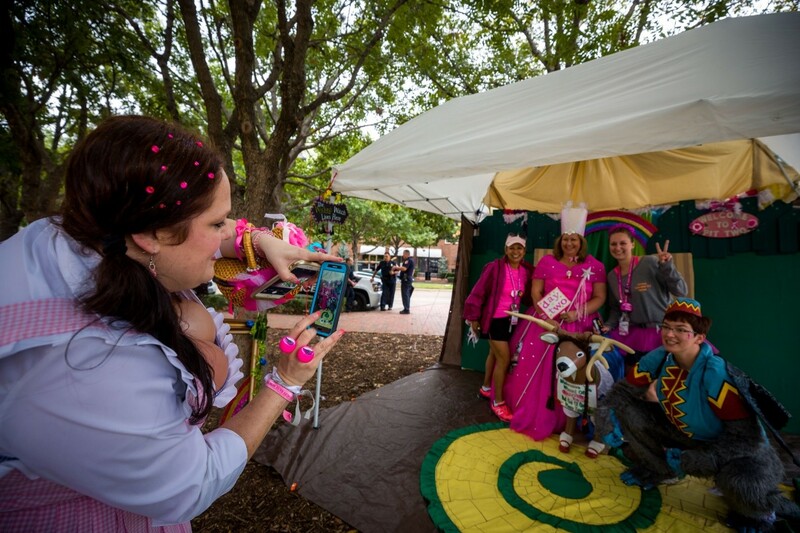 With all of these amazing memories, it’s not hard to see why our 3-Day community comes back every year to make their mark in the fight against breast cancer. 3-Dayers, we ask you; what’s YOUR favorite memory from 2016? Join us in reflection by posting in the comments! Thank you for these memories, and specifically for the memories of Barry’s walk in Michigan. 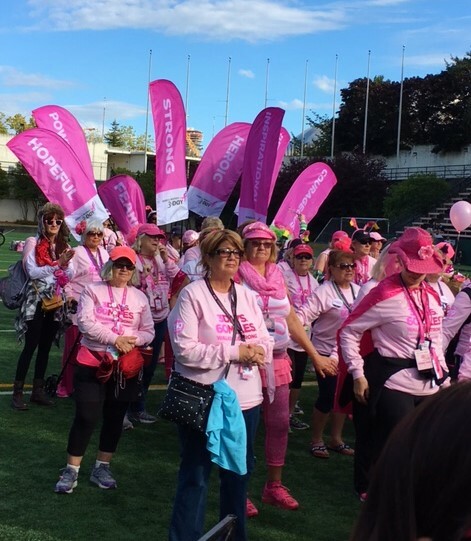 Barry Blauer has inspired so many of us over the years with his commitment to the fight against breast cancer, and we stand with him now in spirit and with tremendous love as he deals with his own personal challenges. Happy New Year everyone – see you in 2017! ← Happy Holidays: Sing along to the 3-Day Jingle Bells!